Curly is often prone to being dry and often takes more care than straight hair. Locks don’t always stick to the head which, unlike with straight hair, makes the hair not completely in touch with sebum on the top of the head. As a result, naturally curly hair has a thinner protection layer of head skin. This also has a negative impact which makes curly hair extremely sensitive to negative conditions. These are all the reasons why you should take proper care of curly hair while it is wet. Wrap your hair in a towel and gently press it so it soaks the water after washing it. Do not ever dry your hair with a towel in a rough manner. A comb with spread teeth is the best for untangling your locks. Combing the locks makes your hair look huge and ragged. The tips of your hair locks are even prettier when they dry naturally. Regarding the hair care, locks love rich care. There is no way you can overdo caring for your curly hair. Shampoos and treatments with natural lipids such as shea butter, jojoba oil or macadamia make every hair extra silky and protected. They ensure the locks are keeping their structure. But why is it so hard to straighten my hair without destroying? Are there any fast solutions? Here are some free tips for your curly hair. Heat makes your curly hair even dryer. This is the reason why it would be ideal to let your hair dry naturally. If you have to use the hairdryer, put the heat on low temperature. 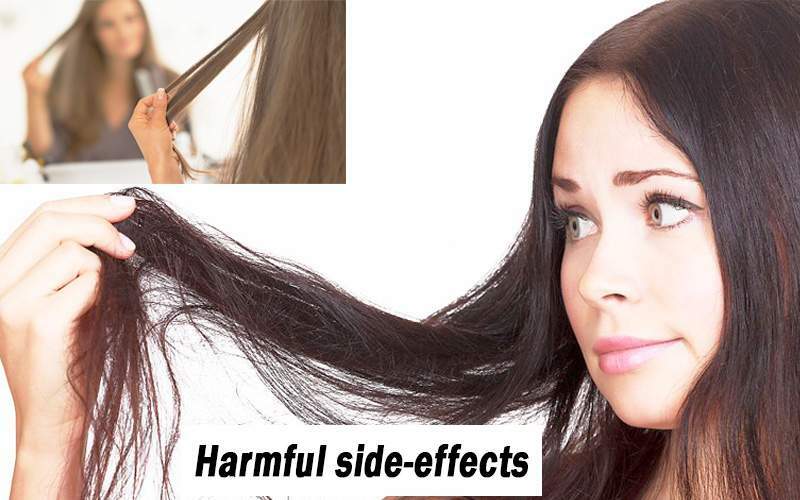 Hair press damages your hair and a lot. Use it rarely, on special occasions like birthdays etc. Even when you do use a hair press use product that protects your hair from heat. A stepped haircut makes your curly hair lively. Just don’t overdo it. Otherwise, you can look like a poodle. Now that we have covered some basic tips and tricks, let’s get to the main topic of the article. 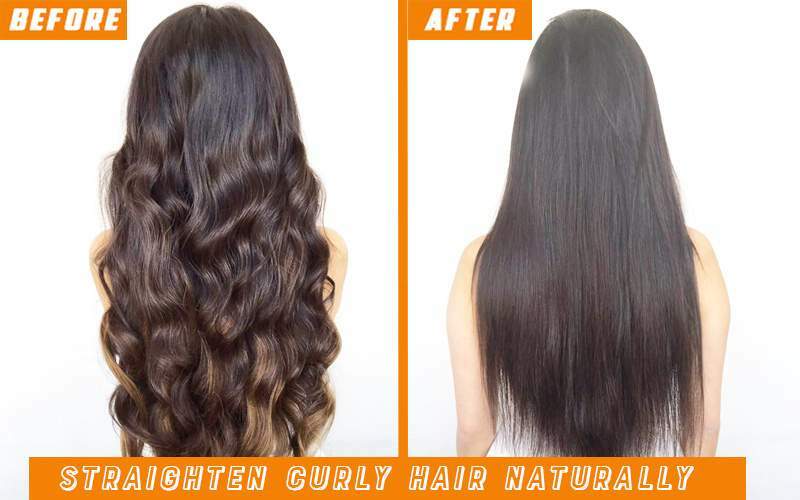 How to straighten curly hair naturally. Believe me, it is doable. It may be time-consuming but it is well worth it. Here are some of the best ways to straighten your curly hair, without using any harmful chemicals or excessive heat which can damage your hair. First off, brush the hair and make it silky smooth before the process. It will make the process a lot easier. Then wash and condition your hair, but don’t use too much conditioner because we don’t want the hair to get greasy. Use the tangle teaser to smooth the hair out. Then straighten the roots by pulling the hair into a tight ponytail. Make it as tight as possible. After that, take a fine-tooth comb. I like combs with many teeth. They are really helpful. All that is left to do is wait an hour for the roots to dry. You have to patient, trust me it pays off. This method is perfect for overnight hairstyles. Now we are going to lay it down. The roots of your hair should be dry and straight. Put the rest of your hair and put it behind your head. Take sections of 1 inch and start brushing through them. Take a section and wrap it around your head like you ‘re wearing a headband. If you don’t straighten your hair with a comb it’s not going to stay straight. I like to use 3 bobby pins because they help keep everything in and it is easy to sleep with them. Make sure your hair is laid flat and tight for the head. If your ends are no longer very damp spray the hair with water to re-activate. Do the exact same thing to the rest of the hair. I like to put a pin near the crown area where I would wear a headband, as long as you’re laying it really tight it’s going to work. Don’t expect to get it perfect the first time, this is a trial and error method, you will improve with every new try. This is just my personal preference for doing it, you can do it your way once you find out the perfect method for yourself. Also, I like to take a scarf and secure everything so I can sleep on it. You should keep it for at least five hours or so. Once all the hair is dry you can remove the bobby pins. The first time I have done this wasn’t easy at all. It takes a lot of practice, but don’t worry you will get it perfect from the second or third try. I hope this heatless method helps you straighten your hair and tame those naughty wild locks! This is probably the fastest method. It was used by the Chinese dynasties, so you guess it is pretty ancient. You only need 2 ingredients and it is really easy! Take 1 cup of whole milk and two tablespoons of honey and your hair will get silky smooth. Use non-skimmed milk. Organic whole milk or coconut milk would be the best. They help thicken and straighten the curly hair. Honey is a natural “straightener” and it also adds shine to your hair. So how to make this mixture? Just take 1 cup of milk and add 2 tablespoons of honey. Mix it until the honey gets dissolved in the milk. Then take an empty spray bottle and pour all the honey and milk mixture into the bottle. Close it, shake it and start spraying your hair. Gently apply it all over your hair. When you apply it on your ends make sure you do it gently with your fingers so that it gets absorbed. When you are applying it over your scalp apply it by massaging the scalp so it gets into the roots. After you have finished, cover your hair with a shower cap. Take the hair dryer and dry your hair with the medium heat for 2 minutes. Leave your hair for thirty to forty-five minutes and wash it with shampoo and conditioner. Once it’s dry, brush your hair and there you have it. Enjoy your naturally silky smooth straight hair! Both of these methods work just fine, so you have to find your personal preference. Here are some additional hair care tips and a list of ingredients that are vital for keeping your hair both silky smooth and healthy! These ingredients can also often be used to straighten your curls! Read on to find out more. Read Also: How to make your hair curly without using curling iron. If you really hate your hair and just want to get it over with, fine, use the chemicals to straighten your curly hair naturally. Here is what a barber will tell you, at every salon. A hair treatment removes curls easy and fast. It doesn’t cost much either! You just wash your hair; make sure no product is left on it, towel dry it. Then apply the straightening solution. It takes 20 minutes before you can wash it off. Rinse thoroughly with warm water, and then apply the neutralizer which resets the hair bonds. In the end, the stylist combs your hair back. Rinse it off again and voila! It feels smooth and silky. It takes some less time to dry. The super-concentrated formula momentarily adds a layer of brilliant shine to a hair that’s fizzy, damaged and dry. The oil serum is further enhanced with botanicals and Keratin for additional anti-breakage effect. It protects the hair color from fading. It also controls humidity and frizz, while Anti-oxidants provide freshness to hair that was once lifeless and dull. This sounds too good to be true right? Well, it is too good to be true. The reality is, your hair will be straight, but it will be damaged for life. I witnessed many cases when people even started losing their hair after such harsh treatments. It is just not natural and this is why it is so bad. It makes your hair dry off after a period of time. The hair can also lose volume. Your hair color can also get messed up. Trust me these treatments are only a part-time solution. Read Also: Best foundation makeup for oily, dry and natural skin. The secret of brushes is in 3D ceramic teeth that are designed to raise hair from the root and heat every little hair on your head, do not hurt, do not damage or burn. It’s easy to use, just combing your hair and getting an incredible result. Your hair will be straight, shiny, lush and most importantly undamaged. Hair straightening is as simple as just combing your hair. 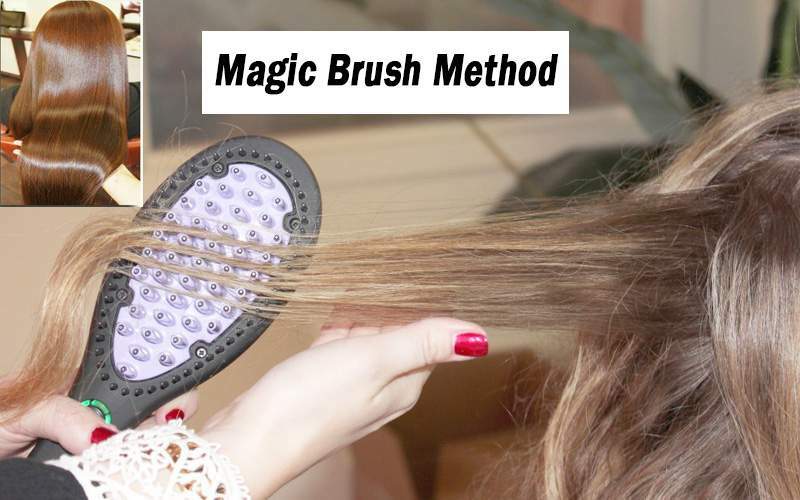 A hairbrush will correct the disobedient locks in a very short time, and with a mild, gentle movement, you can stylize your hairstyle and direct your bead in the desired direction. Can be used for all types and lengths of hair. The LCD display shows the temperature of the brush you can adjust in the range of 60 ° C to 230 ° C and the brush itself will extinguish itself after 60 minutes of use. The maximum temperature is 230 ° C.
The magic brush for straightening and ironing the hair reaches a temperature of 180 ° C for one minute. The unique 3D brush structure provides 3 times larger hair straightening surface than regular hair sprays and allows quick straightening of large hair strands at once, and with Tourmaline ceramics very quickly reaches and maintains high temperatures during use. It corrects the hair of Tourmaline ceramics negative ions that hydrate and nourish the hair, making the hair silky soft and smooth. Especially suitable for damaged hair because of the Tourmaline-ceramic teeth and at the highest temperatures, it does not damage or dry out the hair, and with the help of hair oil can effectively improve the appearance of a dry and disobedient hair prone to curling. 3D Tourmaline Ceramics emits negative ions that hydrate and nourish hair. Coconut milk – Coconut milk is not only great for keeping your hair straight but it also has anti-bacterial properties which protect your scalp from infections and dandruff. Extract the milk from the coconut and let it sit for ten minutes. After that wash your hair and voila! Smooth and silky hair with no excessive heat use and hair damage. Beer – Believe it or not, this alcoholic beverage not only helps brighten the mood, it also brightens your hair! It is rich in vitamins, mostly vitamin B, and deoxidants, which are all good for your hair. Aloe Vera – it has enzymes that help to straighten curly hair, but also it helps with hair growth, plus its gel can hydrate the hair to make it straight. Use one-half cup of 100 ml of this gel. Wash it off after it sits on your hair for thirty minutes and you will have beautiful straight hair. Milk and honey – We already mentioned this combination, but it is so good that I will repeat it again. The vitamins of the milk plus the cleansing properties keep your hair shiny. Castor oil – it keeps the hair straight because of its hydrating properties. Leave it on for a few minutes then wash it away. Don’t use too much, because it has a really strong smell! You don’t want people to smell it, trust me! Fuller’s earth – it hydrates and repairs damaged hair. Use one cup with 5 tablespoons of rice flour, then mix in an egg to make a paste. Allow it to sit for several minutes, then wash your hair to remove it. Enjoy! Banana – believe it or not, this tropical fruit is good for hair just as much as it’s full of vitamins and good for consummation. Bananas are rich in minerals that promote healthy hair. Just mash up several bananas and create a mask for your hair. You will have moisturized hair that is straight and shiny in no time. Celery – Celery is great because it stimulates hair growth and it straightens curly hair. It is another vegetable that is extremely healthy both for eating and making hair products! Apple cider vinegar – I know, this one sounds awful. Well, it is. Your hair will smell. But the smell will pass and the beneficial effects will stay. Vinegar restores the natural PH level and enhances the overall feel and looks of the hair. If your hair is healthy. but it gets dry, you should combine 2 tablespoons of vinegar with 1 cup of water and apply the mixture to your hair after shampooing. Allow the hair to get dry naturally and boom. It will be straight and healthy. Those were all the natural ingredients, which are all super useful if you want to uncurl your hair naturally, without heat or chemicals. 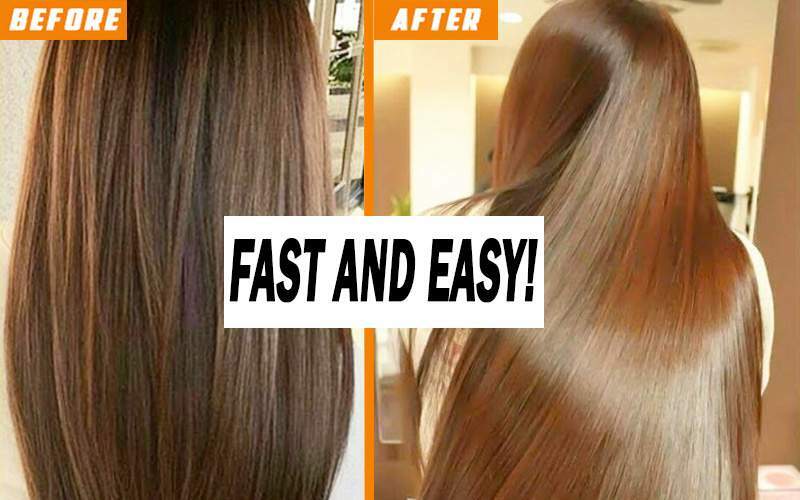 They usually aren’t expensive, and you can get them in any market nearby, You can even mix them and have the extra silky smooth and straight hair. There is a huge advantage in straightening your hair naturally, opposed to the chemical treatment of hair. 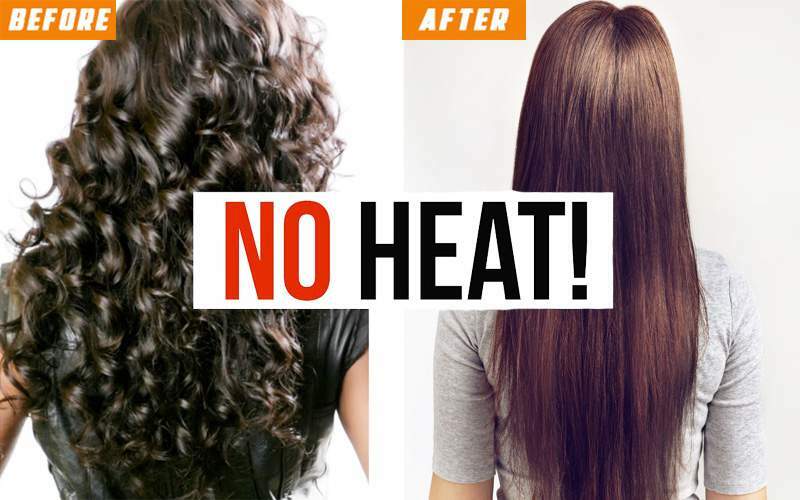 Heat is also very bad for your hair because it drains the water from your hair, so the hair loses its volume. All women know how important it is to have perfect hair. Unfortunately, this takes a lot of effort and time. But it is all worth it. Nothing compares to that feeling when you look into the mirror and see a goddess. Plus, the men will be amazed by your perfect straight hair just as much as your girlfriends. They might even be jealous. They should be. Because you put a lot of effort into your look and you deserve to look divine. If you want a permanent solution stick to the natural, homemade ingredients and it will pay off. This is a promise. If you believe me just Google Brazilian hair straightening aftermath. You won’t ever think of treating your hair with such poison. That is what it is. Poison. Why do you think your hairstylist has to wear gloves in order to apply it? So his skin does not get burned. This stuff is so potent that it burns the skin and causes rashes. I can go on and on about the side-effects of this chemical mixture. Don’t get fooled by commercials or greedy stylists who advertise this abomination. They just want your money. Plain and simple. They will stop at nothing. Unless you want to be another victim of the pharmaceutical industry you will stay away from chemical hair straighteners. I do not want to sound like a grandma so I will stop preaching. But it is really bad for you. Let us summarize once again. Natural ingredients equal happy and healthy hair. You can’t go wrong by using any of the methods mentioned above, except for the last one. Anything natural can only benefit your hair and chemicals just damage it, as well as heat. Even hair dyes are bad for you. 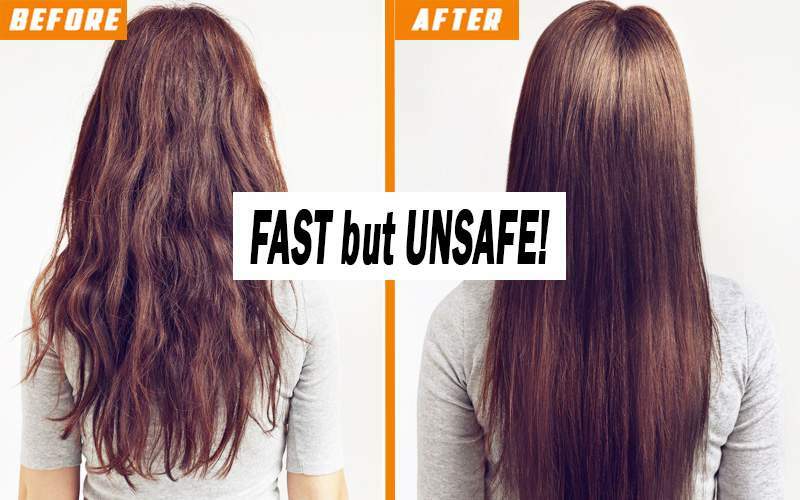 A hair press can scar your hair for life. Once frizzy and shiny hair can turn out to be like a used mop. Don’t let yourself destroy your hair for the sake of “looking cool? for one night. Later you will regret it. I would like to add another comment and I know I will be judged for it but hear me out. Why even straighten a naturally curly hair? Curly hair is unique and desirable – many men are attracted to this type of hair and it’s a fact! Why even bother so much if you are already beautiful as you are? Well, you’re just a woman, that is why. We, women, are strange beings. Every girl with straight hair dreams of nice long locks while with girls with rugged hair it’s the other way around. It’s in women’s blood to be dissatisfied with their looks and always seek perfection. Which is fine. It is completely normal to want to look as good as possible. It takes a lot of effort, money and time to look amazing when you’re a girl. For guys it’s easy. They just use some gel and their hair is good to go. For us, it takes hours at the salon to look pretty. What’s the best wireless earbuds for workout?